INCREDIBLE 3D Virtual Tour HERE! "1 Of a Kind Penthouse Condo"
This Unique loft style PH for sale in Playa del Carmen features 3 bedrooms 3 bathrooms in 2 stories, with 3 terraces, you can enjoy working on your tan at your roof terrace with a glass of wine and delightful ocean breeze. Take a look on our 3D virtual Tour because pictures can't really tell what this property is about. Explore like you where actually there by clicking in all the details. 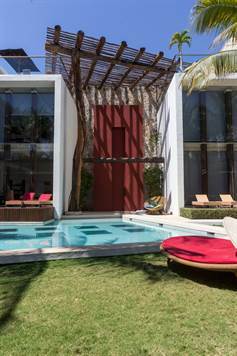 This Luxury Real Estate for Sale at Playa del Carmen is the hidden jewel in downtown, Full with natural light, with double high ceilings, Wooden floors and fine decor. In the heart of Playa del Carmen, so you can step out of the door en walk to 5th. avenue with it's unique full of flavor and color, less than a minute walk to Mamita's beach, it just can't be any better. Once you come back from enjoying all the life Playa del Carmen downtown has to offer, you step into your oasis. Proof of funds might be asked for visits.